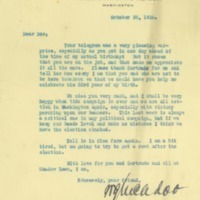 William G. McAdoo writes to Cary T. Grayson about his 53rd birthday and Woodrow Wilson's campaign for reelection. Your telegram was a very pleasing surprise, especially as you got in one day ahead of the time of my actual birthday! But it shows that you are on the job, and that made me appreciate it all the more. Please thank Gertrude for me and tell her how sorry I am that you and she are not to be here tomorrow so that we could have you help me celebrate the 53rd year of my birth. We miss you very much, and I shall be very happy when this campaign is over and we are all settled in Washington again, especially with victory perching upon our banners. This last week is always a critical one in any political campaign, but if we keep our heads level and make no mistakes I think we have the election cinched. Nell is in fine form again. I am a bit tired, but am going to try to get a rest after the election. McAdoo, W. G. (William Gibbs), 1863-1941, “William G. McAdoo to Cary T. Grayson,” 1916 October 30, WWP21019, Cary T. Grayson Papers, Woodrow Wilson Presidential Library & Museum, Staunton, Virginia.